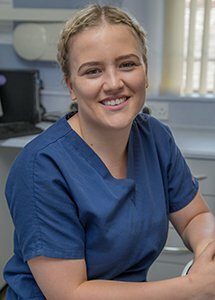 Narome joined the practice as a seventeen-year-old apprentice dental nurse in 2008 and since then has gained her NEBDN Dental Nursing qualifications and her NEBDN Certificate in Conscious Sedation as well as taking time off to have her two children. Narome is an invaluable part of the sedation team and works alongside Rhys Gabe providing our patients with a wide range of dental services. In her spare time, Narome enjoys time with her family and friends and keeping fit.